I have been taking a modest interest in the monetary policy experiment that’s being conducted in Japan. Covering Japan during the ZIRP / Current Account targeting period is one of the reasons i’ve been sceptical about the efficacy of ‘unconventional’ measures, so i’m keen to learn from how this extreme case (both in terms of the patient’s condition and the treatment) develops. A key part of making this policy work is stimulating the export sector, via weakening the JPY. The current account has to balance, so it follows that as exports pick and imports drop (the current account moves) the capital account flows must move in the other direction. In this case, i suspect it’s the capital account flows that will determine the success of the policy — the idea is that the BoJ’s promise of inflation ought to chase capital out of the (potentially) negative real yield JPY environment, and that the JPY will weaken and net exports rise as a consequence. To date, we have seen a large weakening of the JPY and a massive rise in the Nikkei, but it had been unsupported by capital flows — until now. It’s fine for the initial move to be entirely speculative in nature: that’s how markets adjust (someone takes the risk and makes the market a good predictor) — but at some stage the slower flows must take over, or the JPY will snap back. This data shows some encouraging developments, with Japanese selling of foreign assets slowing, purchases of foreign assets picking up. Additionally, the tide of investment inflows into Japan (which had been stirred up by the anticipation of actions from the BoJ that would raise capital prices of bonds and stocks) is starting to turn. This is all encouraging, and suggests that the BoJ might actually have pulled off their trick. Net-net across assets, capital has flowed out for the first time in over a month: the outflow for the week ending 4 May 2013 was a modest JPY166bn. There has been a change in all three asset classes, with net outflows in bonds (JPY54bn), equities (JPY43bn), and money market instruments (JPY69bn). 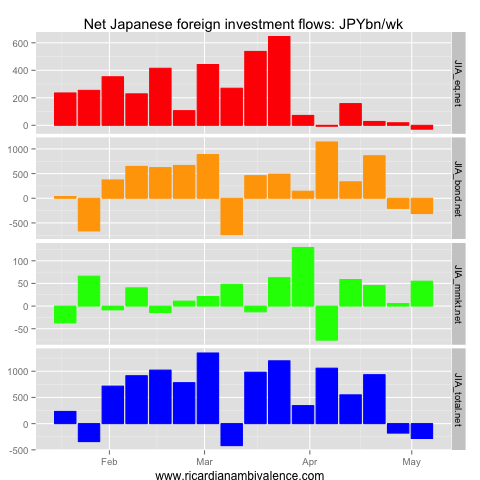 The change in the flows is partly about changes in foreign inflows into Japanese assets (note this may be partly about holidays impairing inflows). These inflows have subsided to only JPY117bn in the prior week. In particular, in the equity market, the BoJ’s policy appears to have (initially) sucked capital into Japan — this makes some sense, as on an FX hedged basis the Nikkei has been an amazing investment. 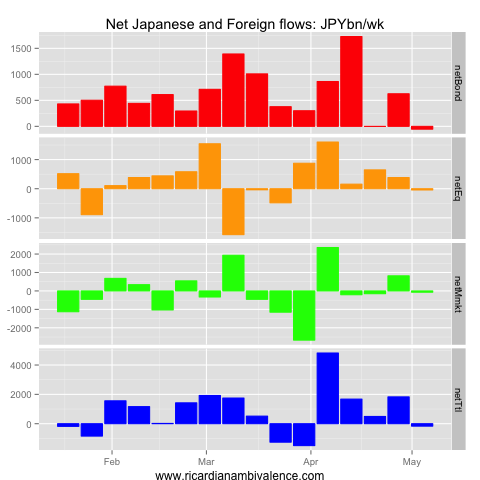 This has changed in the past week, with net outflows of JPY26bn recorded. 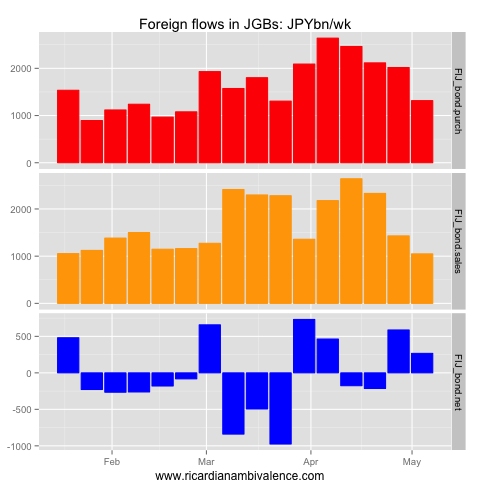 Foreign money is still flowing into JGBs (JPY267bn) however, and this is partially offset by an outflow from the money market (JPY124bn). Taking a close look at equities, you can see the capital that was sucked in by the BoJ’s first meeting (in early April). The surge of foreign buying exceeded the surge in foreign selling (doubtless profit taking), and resulted in a peak JPY1570bn inflow in the week ending 13 April. Purchases of JPY4890bn and sales of JPY4916bn yielded a net outflow of JPY26. Foreign demand for JGBs remains firm – suggesting that some money doesn’t mind fading the BoJ (though foreign buying of JGBs may also be cross-currency basis swap related). 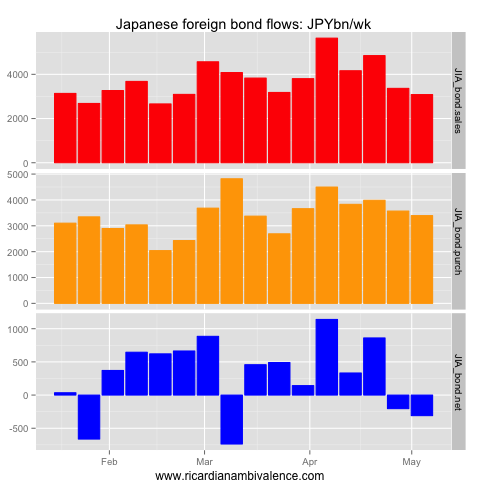 Foreigners purchased JPY1316bn of JGBs and sold JPY1049bn of bonds, for a net bond-inflow into Japan of JPY267bn. Flows on the money are side are very likely to be basis swap related. Foreign purchases of Japanese bills amounted to JPY2181bn, and sales amounted to JPY2305bn, for a net outflow of JPY124bn. 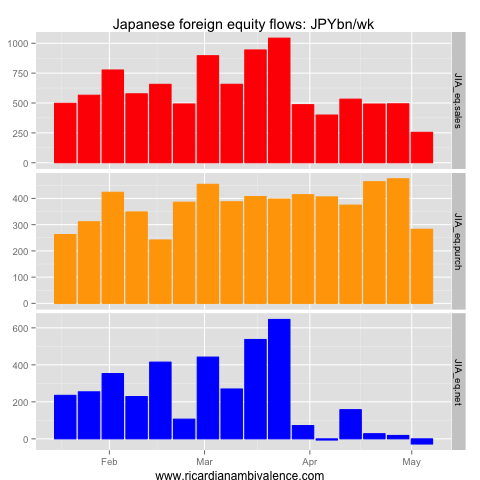 On the other side of the ledger, Japanese equity investment flows are starting to go back to normal (for many years, Japan has been a net buyer of foreign equities). The BoJ’s new policies temporarily spiked equity related repatriation, and this pulled up the aggregates. For the last two weeks in a row, Japanese funds have been net sellers of yen to buy foreign assets (JPY181bn and JPY283bn). This is what the BoJ needs to see! 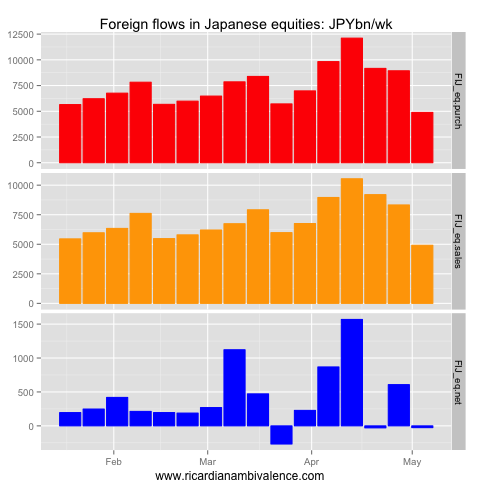 On the equity side, the change in flows was the foreigners sold foreign equities (presumably to invest in domestic equities) ahead of the new BoJ’s first meeting in April. This flow picked up to Y1tn/week in mid March, and is now ~Y500bn/wk (it was a depressed Y250bn/wk in the most recent week). 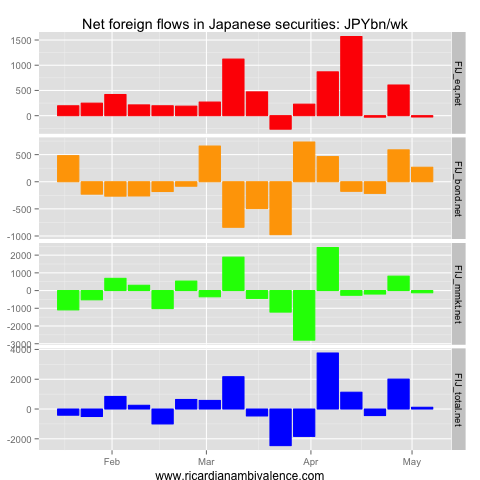 Other the other side, Japanese purchases of foreign equities have been ~Y500bn/wk, which has flattened out the net flow (it was a net outflow of Y28bn last week). Japanese fund flows are also turning outward once again on the bond side. Sales of foreign bonds (to bring money home) have subsided from a peak of Y5.6tn/wk in the first week of April, to ~Y3tn/wk in the most recent week. At the same time, outflows to foreign bonds have held steady at ~Y3.5tn/wk. 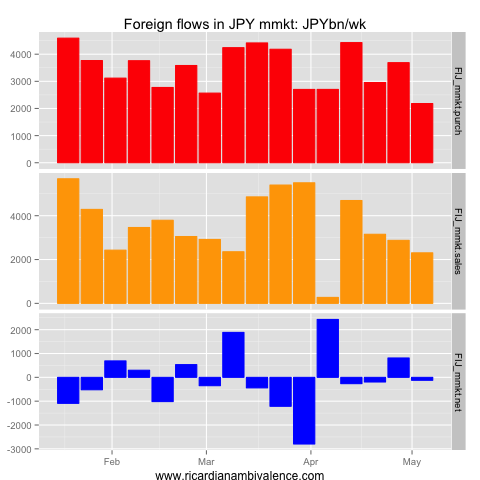 This has taken the net flow to an outflow (from JPY to foreign markets) of Y310bn/wk. Money market flows are much smaller, and have been a hinderance of late (averaging Y35bn/wk. 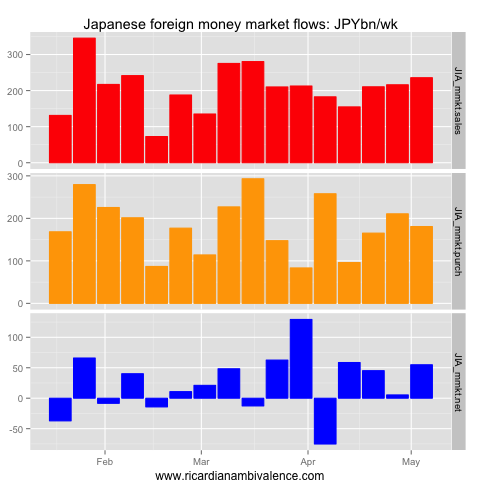 The Japanese have maintained a decent pace of foreign money market sales (averaging ~Y200bn/wk), which has regularly exceed the pace at which they move money abroad to invest in other folk’s short term paper (it’s been averaging ~Y165bn/wk). This entry was posted in BoJ, FX, JPY, monetary policy. Bookmark the permalink. Lars Christensen says that “The weaker yen is an indicator of monetary easing – but not the main driver of growth”. I agree that exports will probably go up, but not sure imports will fall given stronger domestic demand. So it’s not clear to me that net exports will rise. How else does this thing work? Japanese household savings rate is not so high any longer. It is corporate savings that is high. There is little internal demand growth. Either external demand rises and NX and then I rises and GDP goes up, or the policy does not work. I think that imports will fall — the JPY has moved by a lot. Few demands are that price inelastic over a medium term. I think monetarists think about things a bit differently. They see M and V increasing and hence expect that PY will increase one way or another, even in a closed economy. Christensen has some good examples of monetary stimulus/devaluation in Sweden and Argentina leading to higher domestic demand but only modest growth in exports. Thanks. I will check his blog out. If you do, you might see that he has just published a post referring to an older paper by Bennett McCallum, which made similar points.